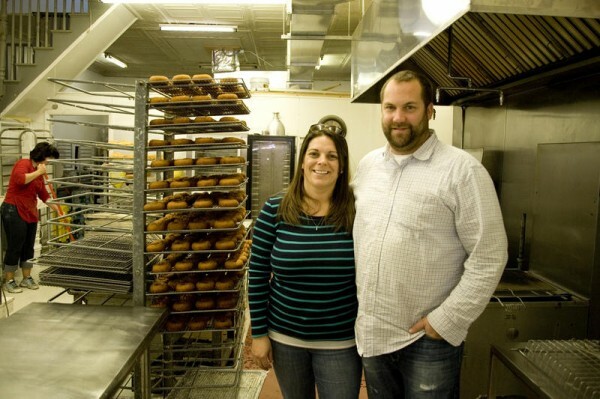 Frosty's Donuts owners Shelby St. Pierre and Nels Omdal stand in their Maine Street, Brunswick, kitchen, which will be expanded to accommodate the business' growth into new markets. BRUNSWICK, Maine — Two staples of the Maine Street food scene are expanding beyond town borders. Frosty’s Donuts will soon be in supermarkets throughout Greater Portland, while Gelato Fiasco will step up the growth of its national distribution network. The growth of Frosty’s and Gelato Fiasco is being aided by loans from Brunswick Development Corp., which was criticized recently for issuing an unusual and unprecedented loan to a business with close ties to the quasi-governmental development agency. Ironically, if it weren’t for the controversy that erupted over that loan in August, Frosty’s co-owner Shelby St. Andre said she may not have not even known such an opportunity existed. But now that she does and has received nearly $138,000 to expand Frosty’s kitchen, more communities will be able to enjoy Brunswick’s signature brand of doughnut. Half of the loan will be forgiven after five years if Frosty’s hires and retains five new employees. Omdal said Frosty’s has already six new workers to ramp up productivity for increased wholesale accounts and the holiday season. “I think we’ll be able to double that,” St. Andre said. Starting in November, Frosty’s will start rolling out distribution to seven Hannaford Bros. grocery stores in the midcoast and greater Portland. St. Andre said Frosty’s will replace Hannaford’s current display case of fresh doughnuts at stores in Brunswick, Topsham, Yarmouth, Falmouth, Forest Avenue in Portland, and at Mill Creek and the Maine Mall in South Portland. The supermarket expansions are just the beginning. St. Andre and her husband and business partner, Nels Omdal, said they’re eyeing new retail shop locations in Augusta, Damariscotta and Wiscasset. The Frosty’s franchise has already expanded to satellite stores in Freeport and Bath since the Brunswick store reopened in February 2012. There’s also talk of reviving a South Portland retail shop, which had a short run that ended last summer. A few blocks down the road, BDC loans are helping Gelato Fiasco expand its national wholesale accounts. The purveyor of Italian-style ice cream has been ramping up production with new facilities it purchased on Industry Road earlier this year. Gelato Fiasco’s new $156,000 loan, half of which is forgivable, will help the business expand its production facilities on 2 and 4 Industry Road, Davis said. Davis said the company has approximately 500 wholesale accounts, as far away as New York, Connecticut, Maryland and Virginia. Gelato Fiasco’s products can already be found at most major grocery stores across Maine. If not for a previous $92,000 loan issued by the BDC, also 50 percent forgivable, Davis said Gelato may have moved its production capabilities out of town to meet market demand. BDC President Larissa Darcy said Frosty’s and Gelato Fiasco made good candidates for the development corporation’s loan program because they both proposed to create and retain new jobs in Brunswick. “[Frosty’s] proposal demonstrates business retention, business expansion, adding jobs and increased visibility for Brunswick in other communities,” she said. The loans were approved at BDC’s Oct. 16 meeting, before its board voted to table a review of bylaw changes proposed to increase transparency and public trust. Board members have said the proposed changes, which include a new ethics policy, have been in the works for a while. But work to adopt them only began after BDC was criticized for issuing a completely forgivable $247,000 loan in July to a business owned by the husband of a former town councilor and former BDC board member. Darcy said the proposed bylaw changes are now expected to be presented at BDC’s Nov. 20 meeting. The board would then have to schedule a special meeting at a later date to adopt the changes. Some of the proposed changes include removing the town’s finance director from the board, adding a fourth citizen member, and requiring advanced notice of all BDC meetings in accordance with Maine’s right-to-know law. The changes would also bar board members or elected officials from seeking BDC’s financial assistance, and clarify that no board members will be compensated, except for reimbursement of meals purchased during meetings. At a Sept. 18 meeting, BDC’s board also discussed the possibility of developing a website that would highlight the development corporation’s history, mission, impact on the local economy and a schedule of meetings.